Our father in the faith, the Rt. Rev. 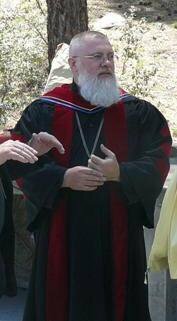 Archimandrite Gabriel [Cooke], fell asleep in the Lord in Chino Valley, AZ on the morning of Thursday, September 10, 2009. He served in the Western Rite Vicariate of the Antiochian Orthodox Christian Archdiocese of North America. In February 1996, he was elevated to the rank of Archimandrite by His Grace, Bishop Joseph of the Antiochian Archdiocese at Holy Trinity Greek Orthodox Church, Portland, OR. On November 22, 1997, Fr. Gabriel was tonsured a as a stavrophore monk by His Beatitude, Metropolitan Herman of the Orthodox Church in America at Saint Tikhon’s Monastery, South Canaan, PA. 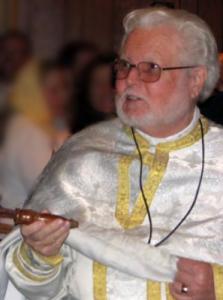 In 1997, he was assigned to Saints Peter and Paul Church [OCA], Phoenix, AZ, which he served faithfullly until June 2006, after which he served at the Prescott Orthodox Community while being attached to Saint John of Shanghai Monastery. Church planter, missionary, monk and holy priest. May Father Gabriel’s memory be eternal! John A. Peck arrived at St. George in February of 2008 and served the parish faithfully to 2012. Born in Detroit, MI in 1962, he grew up there and in Mt. Clemens, MI graduating in 1980 from Mt. Clemens High School. He attended Michigan State University and met the future Mrs. Peck, Deborah Robertson, there. They were married in 1984. Their son, Nathan (1985), was born 14 months later, followed by their sons, Benjamin (1990) and Joseph (1994). It was in 1994 that the Peck family departed the lower 48 for Alaska, attending St. Herman Seminary on Kodiak Island. 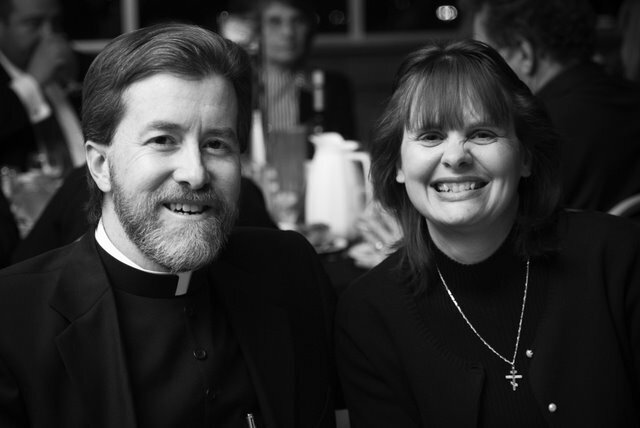 He was ordained a deacon at Holy Resurrection Cathedral in Kodiak, AK on May 4, 1997, and to the Holy Priesthood on June 22, 1997 at St. Innocent Cathedral in Anchorage, AK. Fr. John received his B.A. in English Literature from Michigan State University. He graduated from St. Herman Theological Seminary in Kodiak, Alaska. He completed coursework towards a Master’s degree in Public Administration at Southern Illinois University-Carbondale. He was granted a D.Min. by Veritas Theological Seminary in 2009. Fr. John is very happily married and the father of three boys. Father Bill is a retired priest under the omophorion of Archbishop Nathaniel in the Romanian Archdiocese of the Orthodox Church in America. His journey to the priesthood took many interesting turns including serving the public in Florida as a law enforcement officer and entertaining the public as an actor and opera singer. It was during this time that he met and married his lovely Presbytera Margie. 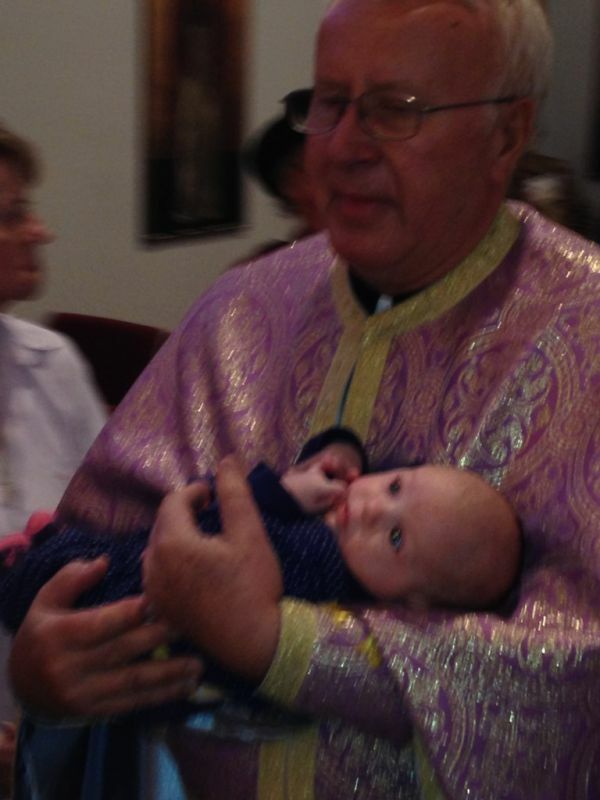 Born into the Roman Catholic faith, Father Bill converted to Orthodoxy in 1986 and went on to study theology by way of the St. Stephen’s Theology course through the Antiochian Archdiocese. Ordained a deacon in 2001, he became a full fledged priest by 2003 just before his 69th birthday! Fr. Bill may be the oldest man ordained to the Holy Priesthood in this hemisphere. He is always ready with a smile and a joke guaranteed to make you smile. Fr. Apostolos Hill served the parish from August 2012 to July 2013. He came to St. George from Assumption Cathedral of Denver where he served for 11 years. At Assumption Cathedral he served for five years as Assistant Priest to two Cathedral Proiestamenoi, and the final six years he served as the Dean of the Cathedral. Fr. Virgil Suciu faithfully served the parish from July 2013 to April 2014 as a visiting priest until we were sent a full-time priest, Fr. Jeffrey Frate.